One of the surprise side effect of writing this blog has been the wonderful supply of great restaurant recommendations for readers. I really appreciate it when people take the time to comment or email me with their suggestions. I got an email last night from prolific Urban Spooner Nat Stockley about Tidlom Thai Antique on Healeys Lane in the city. Nat knows his stuff and spoke highly of Tidlom so I wasted no time in getting there the very next day to check it out. I reckon Healeys Lane is a great little location which has a bit of a street food feeling, well street food potential anyway. In the past I've often wandered down it lamenting the lack on any appetising looking establishments. Tidlom Thai certainly looks the goods and judging by my lunch today it tastes the business too. I had read on Half Eaten that the chef and owner Khun Top had previously had something to do with the now closed Appetizer Kub Klam. Well I'm not sure whether it has actually closed but the only time I tried to visit for lunch it wasn't open and I haven't been back to try again. 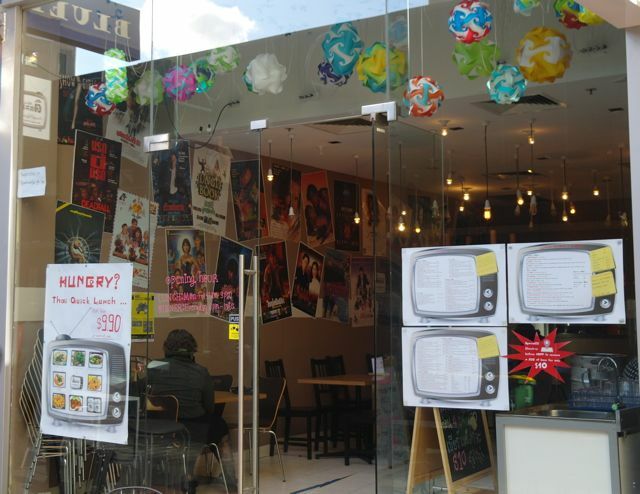 It's a tough one for me because if I'm venturing that far afield for lunch I find it hard to go past Pad Thai in Midtown or Le Bangkok on Lonsdale Street. 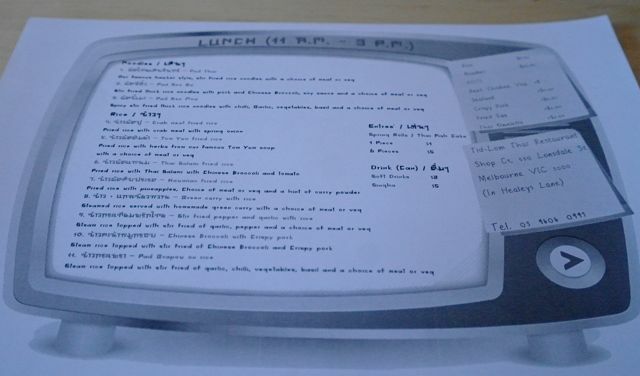 I really like the TV themed menu, which isn't actually blue. (camera white balance issues...) The English font is a bit tricky to read but Khun Top informed me that it is being reprinted in an easy to read font. Personally I love seeing Thai script on a menu as it gives me comfort that the food is being cooked to suit more traditional Thai tastes which is something I'm pretty passionate about. While I was heading there I pretty much decided that I'd be trying the Yum Pla Duk Foo (Crispy Fried Catfish Salad) but on arriving the lunch menu didn't offer this specialty. It wasn't a problem though as the $9.90 lunch specials all sounded fantastic. Pad Thai of course and Pad See Eew (my latest obsession) but even better Pad Kee Mao (my new obsession). Some great sounding Fried Rice dishes (Khao Pad), including Khao Pad Poo (Crab Meat Fried Rice), Tom Yum and Green Curry Fried Rice to name just a few. Also very enticing is the Pad Krapow and the Pak Kanna Moo Krob (Chinese Broccoli with Crispy Pork). All these great dishes for less that $10 each. Thanks again Nat, I definitely owe you one! 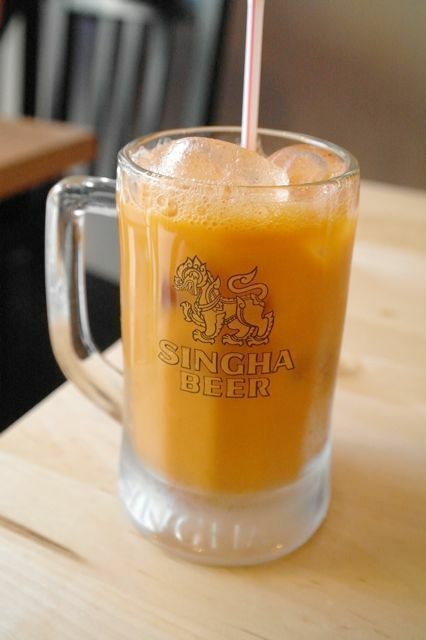 The Cha Yen (Thai Iced Milk Tea) was fantastic. Tidlom also do a Thai Iced Coffee, another favourite of mine. Given the less than great quality of espresso coffee in Thailand this was my regular morning caffeine hit on my recent visit to Bangkok. 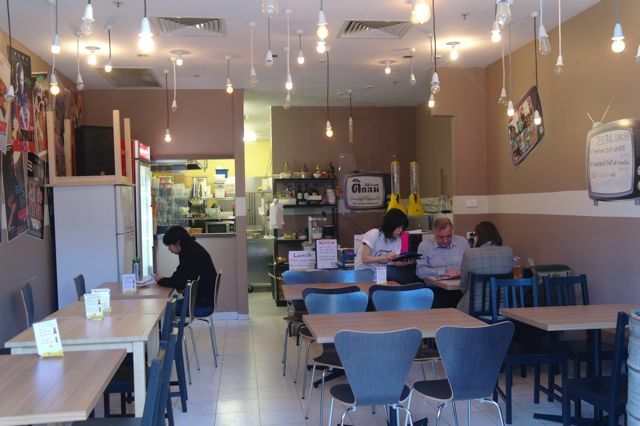 When you visit Tidlom Thai make sure you skip the can of Coke and give either the Cha Yen of Cafe Yen a go. I reckon they're both a great accompaniment to spicy Thai food. Speaking of spicy Thai food this is the Pad Krapow Gai (Chicken Krapow) that my dining companion ordered. It all looked pretty good but certainly not what I would call a traditional Thai Krapow. Now I'm not 100% sure about this but I pretty much expect minced protein in my Krapow (unless it's a seafood variation). I also found the sliced onion a bit excessive however I did like the use of snake beams and the flavour of the mouthful I tried was certainly very good. To be honest I'm more of a pork Krapow man myself. Oh yeah, one more thing, "Where's the egg?" I just can't abide Krapow without a crispy runny yolk egg. (UPDATE: I returned to Tildom today and noticed that crispy egg is available as an extra for $2). 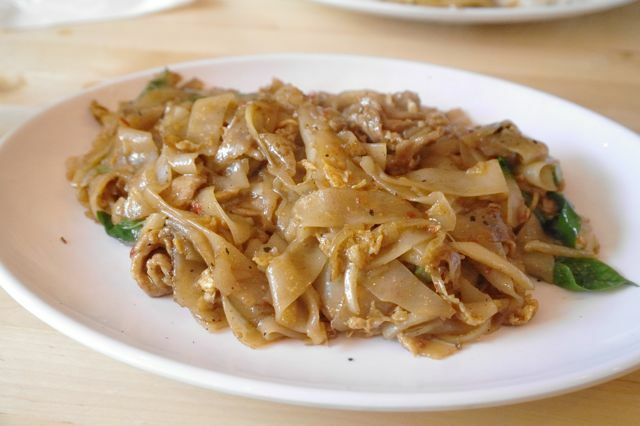 Ever since I returned from Bangkok I've been obsessed with Pad See Eew and have slowly been working my way back to all my old favourite places to try their versions out. I find it quite interesting to try the different interpretations. Personally I much prefer it over Pad Thai but that's just my opinion. Tidlom Thai have Pad See Eew which I will obviously be trying soon but they also have Pad Kee Mao which appears to be quite similar but it uses basil and also a lot of chilli! It was a very generous serve but I easily demolished the plate without coming up for air. There's something about that smoky wok flavoured slightly chewy wide rice noodles combined with the chilli and soy that is just fantastic. This spicy dish would go perfectly with a cold Singha. I'm not sure I will be ready for beer drinking until the weather starts to warm up but Khun Top's offer of $45 tabletop 3L mini kegs of original Singa (the yellow things in the background of the picture below) had me making plans for long Friday lunches on hopefully warm sunny late September afternoons. 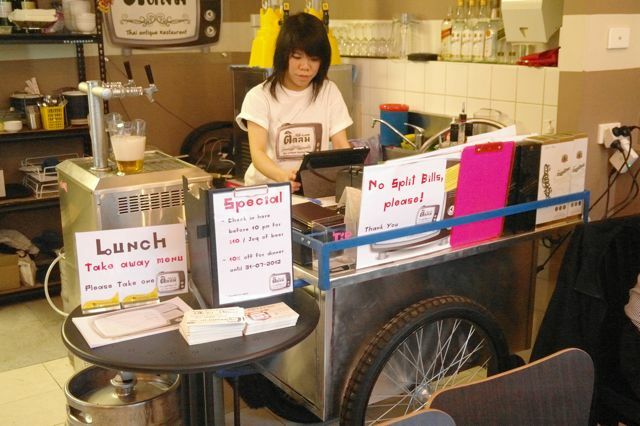 The best part of the fitout at Tidlom has to be the original Thai food cart that doubles as the counter. Hopefully come summer Khun Top will find a way to set this up in the laneway and use it for its intended purpose of cooking up delicious Thai street food. The thought of sitting in a Melbourne laneway enjoying a few Singas with friends on a balmy Summer evening with the sublime smells from a Thai wok wafting though the air brings a big smile to my face. 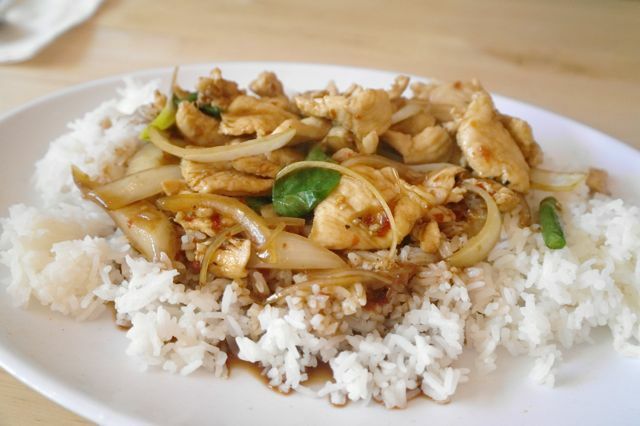 - yes, Grapow is usually cooked with minced protein but nowadays on street food version pieces protein is widely used. Other variations are combination of protein and vegetables such as onion, snake bean, bamboo shoot, heart of palm and so on. This is not cost cutting solution but rather introducing other texture to the dish. Our version uses onion to give the natural sweetness and snake bean gives the bitter taste and sweetness for after-taste. But I promise you , Khun Andy to cook my own version that I eat at home with mince pork and heart of palm on your next visit, see how you will like it? See you back soon krub Khun Andy. I have updated the post with your corrections and I will definitely take you up on your offer of home style cooked Thai meals! Anyway, I'll probably see you tomorrow which will be 4 days straight!